From 1793 until today, the Capitol building in Washington, D.C. has been a topic of interest—and has been the subject of several Government publications! 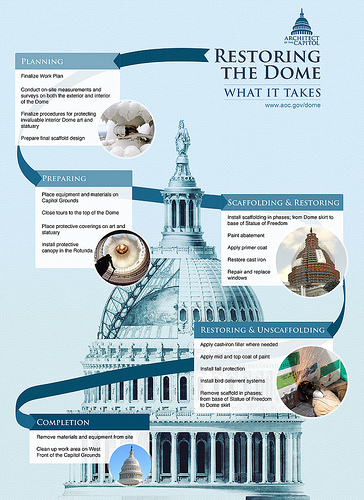 The Capitol dome is soon to be covered with scaffolding for two years for a restoration project, so let’s try to uncover some Capitol treasures before that happens. Representative Rufus Choate in 1833 came up with this idea: “We have built no national temples but the Capitol; we consult no common oracle but the Constitution.” Do you agree? You’ll find that quote as well as plenty more information about the building in the book History of the United States Capitol: A Chronicle of Design, Construction, and Politics, also known as S. Doc. 106-29 and part of the Congressional Committee Materials collection on GPO’s Federal Digital System (FDsys). If you’re a more down to earth person and want details on the cost of building the Capitol, check out Chapter 10 of H. Doc. 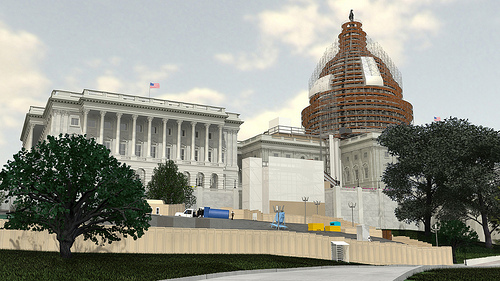 108-240, Glenn Brown’s History of the United States Capitol , also available on FDsys. The Capitol dome is part of what makes it one of the most recognizable buildings in the country—but did you know it is not the first dome that was on the building? The current dome was designed by Thomas U. Walter and built over 150 years ago, from 1855-1866. 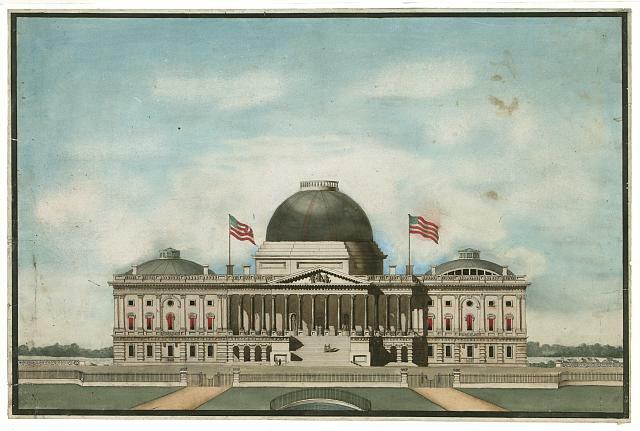 The first dome was designed by Charles Bulfinch and finished in 1824. The last time the dome was restored was 1959-1960, and the cast iron now has more than 1,000 cracks, so it’s about to get restored in a two-year project. What about inside the building? The National Statuary Hall Collection has two statues from every U.S. state, and H.R. 5711 was introduced in the 111th Congress (2010) to allow U.S. territories to furnish statues for the hall too. Illinois was the first state to send a statue of a woman —educator and reformer Frances E. Willard’s statue was installed in 1905. 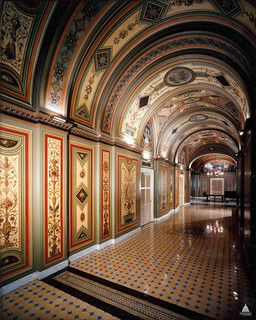 The Capitol also contains striking artwork by Constantino Brumidi. This Italian artist came to the United States when he was almost fifty years old. Brumidi embraced American history and the United States, signing himself “C. Brumidi Artist Citizen of the U.S.” on one of his Capitol frescoes. Read more about Brumidi and his work in To Make Beautiful the Capitol: Rediscovering the Art of Constantino Brumidi, Constantino Brumidi: Artist of the Capitol, or at the Architect of the Capitol’s Web site. For those who like historical tidbits (and cider), check out joint resolution S.R. 7 from 1867 prohibiting alcoholic beverages in the Capitol . . . or the 2011 hearing on “Nuclear Energy Risk Management” before a House committee which says the granite of the Capitol building means it has “some of the highest radiation levels in all of the United States, about 85 millirem per year.” (But don’t worry, cross-examination reveals that that level is just “normal radiation exposures from natural background.”) And finally, for even more detail, historical facts, and great images, don’t forget to check out the fabulous Web site of the Architect of the Capitol – they are experts on this fascinating building! About the author: Lara Otis is an Outreach Librarian for the U.S. Government Printing Office’s Library Services & Content Management (LSCM) Division. This entry was posted on Tuesday, August 26th, 2014 at 11:31 am and is filed under Art and Architecture, Congress, Libraries, Library of Congress (LOC), U.S. History. You can follow any responses to this entry through the RSS 2.0 feed. You can leave a response, or trackback from your own site.